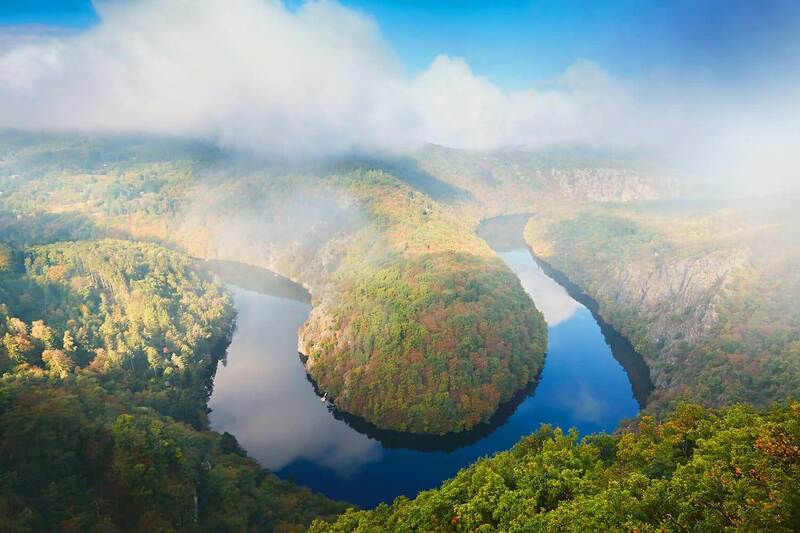 The Vltava, also known by its German name Moldau, is the longest river within the borders of the Czech Republic. It is the river that flows through Prague and Český Krumlov. Its source is in the Bohemian Forest (Šumava) and it merges with the Elbe (Labe) at Mělnik in the Central Bohemian Region. The Vltava is sometimes called “the Czech national river” and it appears in many works of art. The famous Czech composer Bedřich Smetana devoted one of the six symphonic poems in his cycle My Homeland (Má vlast) to the Vltava. Find the best accommodation in Prague or any other destination at hotels.com. Getting to Vyhlídka Máj is relatively easy and it is a good place for a day trip if you’re staying in Prague. If you go by your own car, you will have to leave it in the village and walk about 1 km. The path is not difficult to find, if you analyze the map and make use of Google Street View before going there. The village is small. Bus no. 438 going from Štěchovice to Benešov stops in Teletín. It takes about 18 minutes to get from Štěchovice to Teletín by bus. Timetables can be found here. Alternatively, if you feel like hiking, you can take the train from Prague hlavní nádraží to Jílové u Prahy and walk from there (about 10 km / 7 miles). Having a good tourist map with hiking routes and trails is recommended in this case. © bigstock/chalabala, © bigstock/Jan S.